Nelson filmmaker Amy Bohigian’s new interactive video installation Wide Shot/Close Up explores the collective human experience. Bohigian interviewed 24 Columbia Basin residents from diverse backgrounds, asking them to reflect on their identity and their relationships with themselves and others. By sharing their candid responses, Bohigian invites us to see beyond the labels we ascribe to one another, in order to connect on a fundamentally human level. It was 1960, the beginning of the Age of Aquarius. Zeljko Kujundzic, a fifth generation artist from former Yugoslavia with a sometimes fiery disposition, was hired as the first principal of the newly formed Kootenay School of the Arts. For the next four years, he would impart rigorous studio practices inspired by his European training. Kujundzic taught his students to make their own art materials using locally sourced clay for sculpture, mineral pigments for mixing paints and metals for jewellery. Although he was only there for a relatively short period of time, his influence marked the beginnings not only of KSA, but perhaps also of Nelson’s re-invention as the “Best Little Arts Town” in Canada. With his bold lines, iconic imagery and strong compositions, Kujundzic’s own practice was a reflection not only of his own sensibility, but of the times themselves. 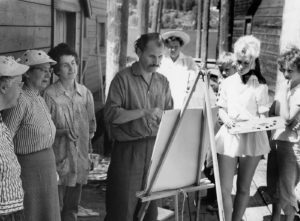 Join us for this retrospective exhibit that explores Kujundzic’s diverse artistic practices, and traces the beginnings of the now iconic Kootenay School of the Arts. The Sons of Freedom, a distinct group of reformed Doukhobors based in mainly Krestova BC, gained worldwide attention during the early 1950’s. They burned their own houses to demonstrate rejection of material wealth and private property, and marched naked as a form of spiritual cleansing and protest. When a public demonstration was planned, photographer Jane Sloan often showed up before the police. A trusted outsider, she was invited by the Sons of Freedom to document their cultural activities and protests, and her evocative photographs quickly spread throughout Canada and parts of Europe via newspapers and publications such as Life Magazine. 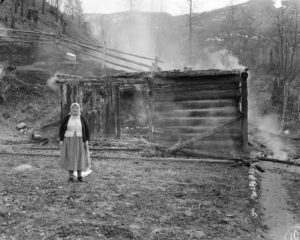 Selected from the larger Stevens Studio collection in the Touchstones Nelson Archives, the photos in this exhibit document a compelling chapter in the history of the Sons of Freedom Doukhobors, as well as our community. Although much of the collection has been made available for viewing online (at http://www.flickr.com/photos/touchstonesnelson), this will be the first time the photos have been exhibited publicly since they appeared in media outlets over six decades ago. This exhibition will feature work by well known long-time Nelson area resident and KSA instructor Courtney Andersen. Since coming to the area in 1993, much of his work has been shaped by a combination of reclaimed metal, his personal sensibility and a sharp pair of tin snips. According to Andersen, “Humour reveals itself everywhere in my art, sometimes subtly, sometimes overtly. It is an important characteristic, and these materials appeared very appropriate for this. The off-cuts would provide an unexpected and oft times humorous design attribute. 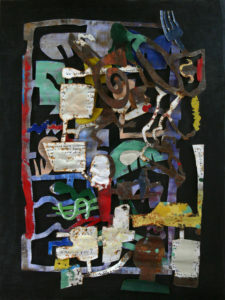 I enjoy uplifting the work with titles which bring a smile to the beholder.”From smaller pieces in cera cola (a cold, wax based medium) to large scale metal sculpture, this will be an opportunity to not only see the range of his work, but gain an appreciation for his sensitivity to material and intelligent humour. 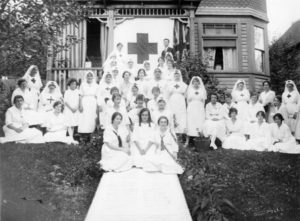 Good Medicine is an exploration of the individual stories, images and artifacts that make up Nelson’s dynamic healthcare history. This eclectic exhibit will trace the both the development and decline of health services in our community up to the present. Broader issues will also be touched upon, including the development of Medicare in Canada and the social determinants of health. Visitors will be invited to answer the question What is Good Medicine to you? on the chalkboard wall in the lobby. Hmmmm. That looks familiar…..That’s one of the initial reactions that people can have to art created from reused or recycled material. 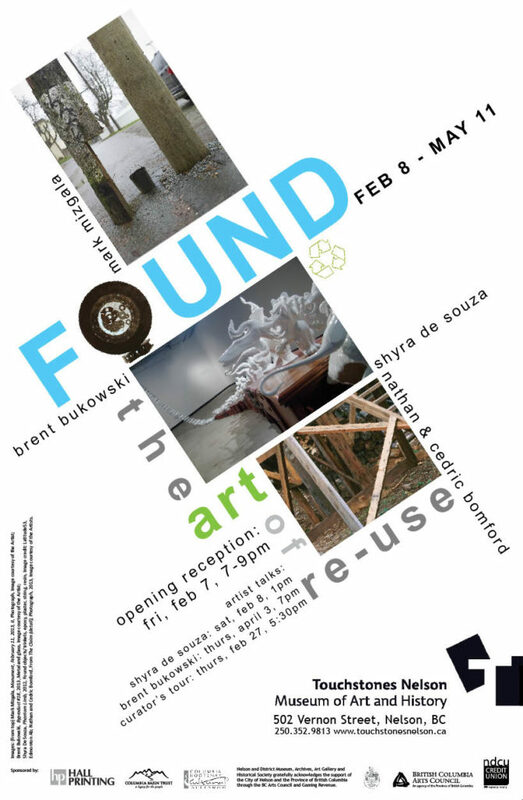 In different ways and for different reasons, Brent Bukowski (Kaslo), Shyra De Souza (Calgary), Mark Mizgala (Vancouver) and brothers Cedric and Nate Bomford (Winnipeg and Vancouver Island, respectively) all make use of reused or recycled material in their work. Finding materials in back alleys, old houses, thrift shops and landfills, they look past an object’s original use to reinterpret both its function and meaning. Join us for this exciting exhibition of art that challenges preconceptions by offering a new take on old materials.